The New Year started with Pauline's recovery from the bad cold contracted in late December. In mid-January we hosted a baby shower for Xue, with about 26 attendees. While January weather in Bozeman was a bit dry but not unusual, it was an uncommonly rainy month in Pacific Beach. On the rare sunny days we enjoyed walking to the beaches. 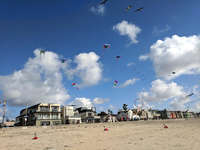 On a day with strong on-shore wind, we discovered a display of unusual kites. Oh, yes – exhibits at the Getty Center were amazing and the concerts were great, with Zubin Mehta conducting! The Disney Concert Hall is impressive and the French Fries organ inspired us to plan a return next year for an organ concert. Our two-day drive from Pacific Beach back to Bozeman at the end of January was uneventful. On arrival, Rosie leaped out of the truck and tried to bury herself in a snow bank, thereby expressing her preference for snow over sand. Our stay in Bozeman was short lived; on 11 February we left the dogs with Claire and flew back to Pacific Beach for a week to host a couple who won the Cancer Support Community charity auction bidding for a B&B stay at our PB home. The couple was two doctors, one of whom had been Pauline's oncologist during her cancer treatment. Back in Bozeman, son Dan and friend Matt arrived to visit and do some skiing. Dan and Gary went skiing in -9°F temperatures and did manage to do 10 runs, with frequent breaks in the lodge to warm up. At the end of February we had 3 straight days of below zero temperatures, heavy snow and high wind. In these conditions, it is pointless to plow the driveway or shovel the walk since snow drifts back in within minutes. (That bare space out the front door has been scoured by the wind.) Plowing only adds to the height of the snowbanks, making the next set of drifts even deeper. In these conditions we plow a narrow path if someone needs to leave and have them call before returning so we can plow a new path to get back up. On 28 February we flew to Seattle for the formal dedication of the new Bill & Melinda Gates Center at the University of Washington. The building will provide expansion room for the Computer Science & Engineering and Electrical & Computer Engineering Departments. We joined about 200 other donors for the event. Pictured left to right are: Bill Gates (with his usual attire and expression), Brad Smith (President of Microsoft), Jay Inslee (Governor of Washington State and candidate for US President), Ana Mari Cauce (President of the UW), Ed Lazowska (CSE Professor), and Hank Levy (back to camera, Chairman of the CSE Department). Melinda Gates was travelling and unable to attend. Bill Gates' speech was especially poignant, given the recent death of Microsoft co-founder Paul Allen, for whom the Computer Science & Engineering Department is named. 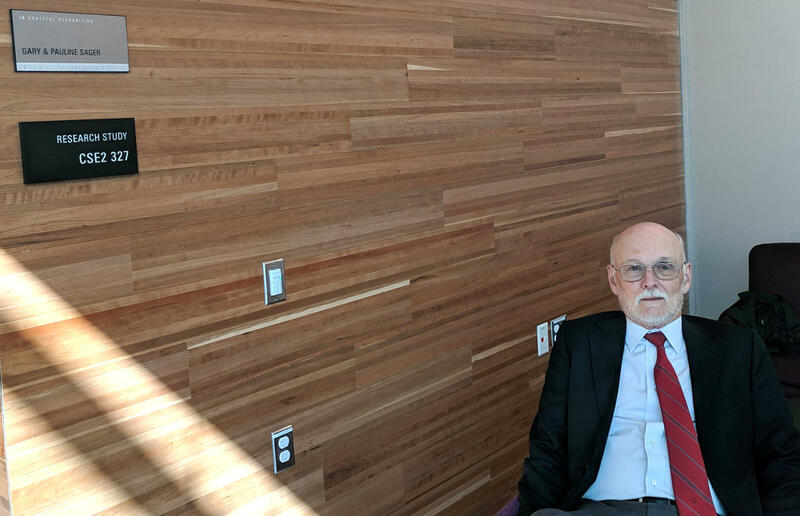 Since Gary is a graduate of UW CSE (PhD, 1972) and we are long-term donors, a study lounge was named for us; we used it to relax and charge our phones before the ceremony. Our names are also on the plaque in the building foyer. After the ceremony we were treated to a guided tour of research projects underway in the CSE and ECE Departments. We also ran into several of Gary's professors, who are now all Emeritus. Another purpose of our trip to Seattle was to connect with Gary's first cousin once removed Peggy. They had never met and discovered each other through a DNA match at 23andme.com. It turns out she lives in a Seattle suburb so this was an obvious add-on to a long-planned trip. We had a great visit and vowed to get together again in the future. The average temperature for February at the Bozeman airport was 9.2°F. That was the average over all the days, not the average high or average low. The expected average daily high and low for February are 35.5°F and 15.3°F, respectively. The actual highs and lows have been 20 to 30 degrees below average. January and February are typically low precipitation months and precipitation increases through June. Unless March and April are warmer or drier than normal, that means even more snow! The third of March finally saw a sunny day. Gary waded through waist-deep snow in -7°F temperatures to get a picture of the devastation. Starting March with several days of clear weather was the good news; the bad news was the Chronicle headline for 5 March: New lows: Bozeman breaks records for low temperatures. This unusual cold is the result of a weak polar vortex. Lest one think these low temparatures disprove global warming, it actually means the polar area that should be cold is warmer than it should be. We dug a path to the propane tanks to make sure we are not running low; they are at about 70% capacity, which should be good for a couple of months. We also hired a neighbor with a tractor and snowblower attachment to make room for the snow to come. In early March Gary and Pauline each made a trip to the Bay Area to visit Kendal and Brandon, plus spend a little time with Arthur and Alixandra. Any visit with Kendal is likely to involve doing something with bees. 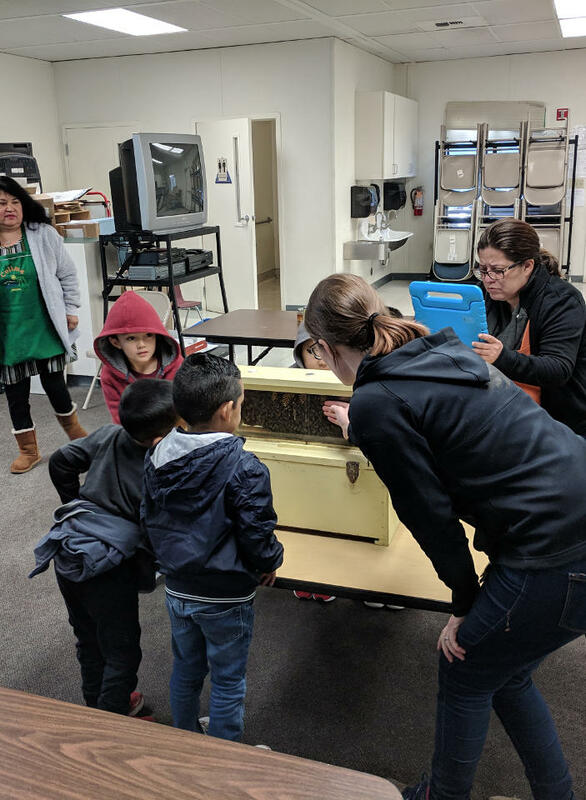 We both got to help with her beekeeping classes – ranging from pre-school to adult – and help maintain the bee hives she maintains around the Bay Area. 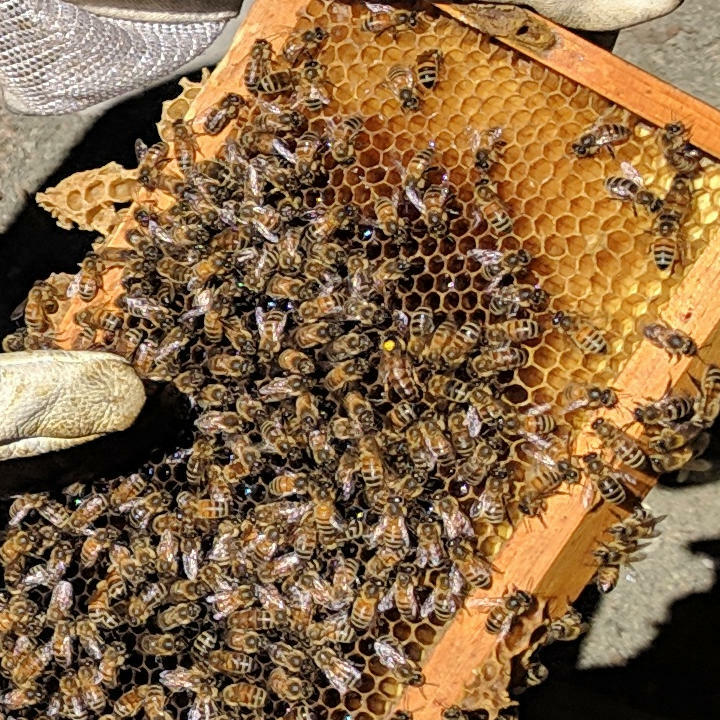 On one day, Gary helped split one thriving hive into three, which involves locating the queen bee – near center in this picture. (The queen is painted with a yellow dot to indicate she was born in 2017.) The two hives without queens have to be configured with appropriate resources so they can create a new queen. We left one queenless hive in the original location and loaded the two “new” hives into the SUV. 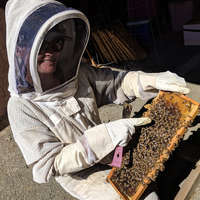 While transporting the two beehives to their new locations, about 100 bees escaped but we managed to plug the leak and flush the fugitives out. 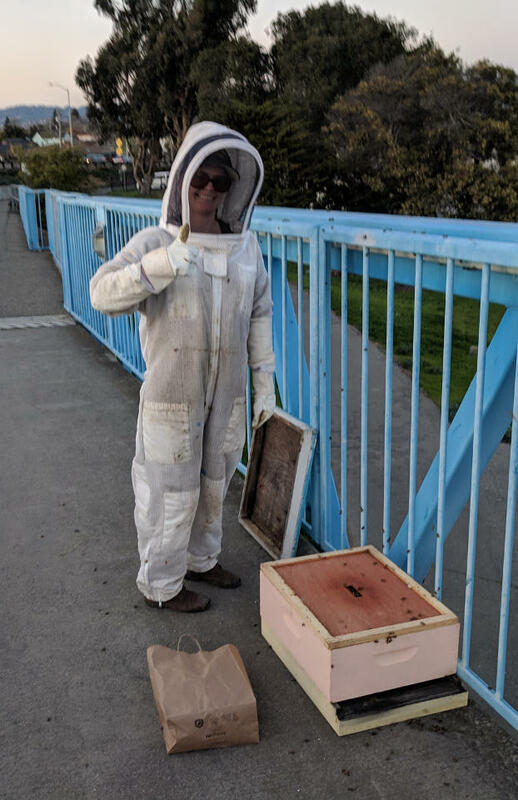 On the way home Kendal got a message that a swarm of bees had settled on a bridge near her home, so we made a detour to collect them. Fortunately there was still plenty of beekeeping equipment in the SUV. 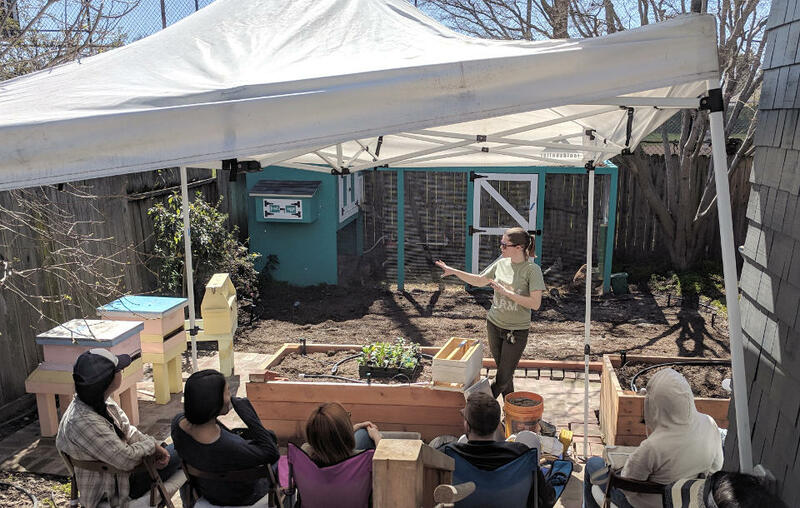 In this picture, Kendal is about to shove the main body of the swarm into a bag so she can dump them to a hive box. 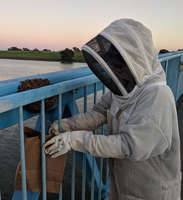 It was just past sunset and temperatures were dropping; the bees quickly decided the hive box was better than the railing and many of the remaining bees joined them. All this transpired while rush-hour traffic zipped by, probably wondering what the two people in space suits were up to. After about 20 minutes we closed up the hive and took them home. Quite a busy day! In mid-March the weather suddenly switched to spring, turning the driveway into a sea of mud, aka “Mud Season,” and the ski area into morning ice with afternoon slush. This usually occurs in April. and is one reason we had planned to head south at the end of March. This year, the combination of a long period of cold in February plus a lot of snow created an ice dam along the north foundation of the house. The ice kept melting water against the house and it found its way into the house, wetting drywall and forming puddles on the lower floor. Claire and Jim shoveled and chipped away ice to allow drainage and the leaks slowed down. Our commitements required us to stick to our planned trip. We finally packed up a few things, shut down the BC house and started our drive to our PB home. Claire will do some daily checks and mopping until the ground thaws enough to allow more drainage. We will look into how to remediate this during the summer. In early February, Claire's boyfriend Jim spotted a collared elk walking past the Carriage House. Claire was able to get the data regarding this particular elk (BA148) and its wanderings over the past couple of weeks. Claire's comments are below the pictures. (Note: the collar data is mapped onto satellite views taken in summer.) I have indicated our house as "BCL" on the maps. On Saturday afternoon (09 February) the elk herd walked past the carriage house and Jim noticed one had a radio collar – this was a brand new collar deployed from FWP's last capture efforts in the Bangtails. A good friend of mine leads these efforts and she told me that as soon as capture finished, one of the collared elk immediately went west in the direction of Jackson Creek; this was animal BA148. The first map shows her locations for the past week (passing right past our houses). 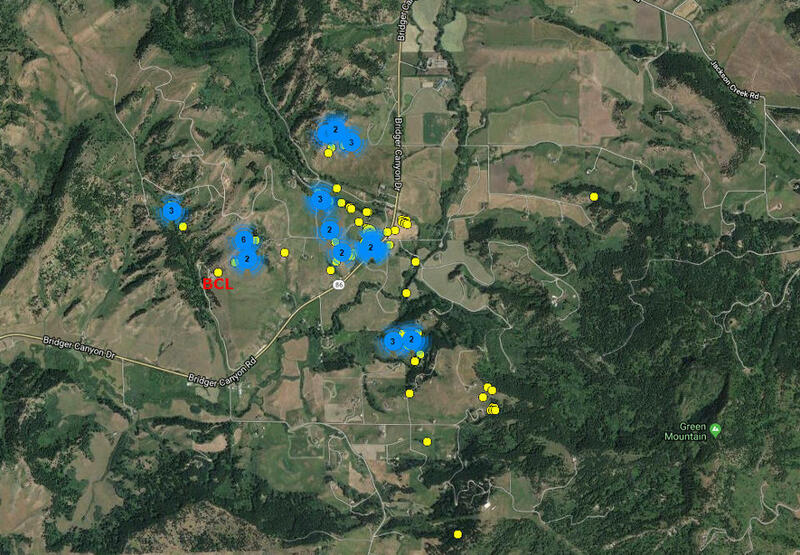 Yellow dots are single reported locations, blue dots are overlapping reported locations. This bigger map shows her locations since capture on Jan 20th. I think the collar downloads a waypoint every few hours or so. We are not sure if this is the resident herd that often walks through the property or if these are different elk exploring new habitat. These are LOTEK collars that are remotely downloaded so we can watch their movements. She was collared in Orea Creek.